How could a man write a novel about one of the most famous and tragic events in history... 14 years before the event occurred? How could a photographer’s assistant with a 9th grade education diagnose the cause of (and consequently cure) a child’s illness... when a team of trained doctors couldn’t? How could someone make thousands of accurate predictions about the future and summon long-hidden information from the past... without using trickery or deception of any kind? Most importantly, how can YOU learn to access this same type of remarkable information? In 1898, a British man named Morgan Robertson set out to write a career-making novel. It would be the story of a magnificent ocean liner, the biggest and finest ever built, equipped with every possible luxury and billed as "unsinkable." The ship would set sail from England bound for New York, packed with passengers ranging from the deeply impoverished to the magnificently wealthy. But... it would never reach its destination. It would strike an iceberg en route, and as result of the damage and a severe scarcity of lifeboats, hundreds of men, women, and children would perish in the icy waters. Robertson titled his masterpiece Futility: The Wreck of the Titan. Yet despite his dreams of literary glory, the book was published to forgettable reviews and quickly faded from memory. The mighty Titanic - a ship nearly identical to the one described in Robertson's book, down to the smallest details, even the name - met its tragic fate in almost exactly the same way and on the VERY SAME DATEthat Robertson's ship did in the pages of his novel... which he conceived of more than a decade earlier. The amazing "Book of Life"
Without realizing it, Morgan Robertson had led himself into a state of consciousness wherein he accessed something known as the Akashic Records. The Akashic Records are, essentially, the storehouse of every thought, word, deed, feeling, and intention that has come from you, me, and every other person who has lived. Throughout the ages, the tremendous collection of information has been miraculously preserved forever... impressed upon an etheric substance called akasha, which is said to surround the earth like a force field. When he connected with this information, Robertson literally witnessed the unfolding of future events - an experience he thought was simply the emergence of the "big idea" he'd been searching for. That is how he was able to unknowingly write the story of the sinking of the Titanic more than a decade before it actually happened. Edgar Cayce - the renowned 20th century clairvoyant, mystic, acclaimed "sleeping prophet," and most documented psychic of all time - first encountered the Akashic Records as a young man, and he maintained an intimate working knowledge of them throughout his life. While in the trancelike state he entered in order to give a reading, he frequently described them in detail, relating the vision of a man bringing a large book to him, which Cayce would page through until he came to the particular information he was seeking. Edgar Cayce was unquestionably an extraordinary individual with a unique gift. And yet the Akashic Records - the source from which he received all of his insights and prophecies - are open and accessible to us all. In Living Your Divine Contract: How to Study the Akashic Records and Discover Your Heart's Purpose, author, lecturer, and world-renowned Edgar Cayce scholar Kevin J. Todeschi gives you the secrets to accessing the sacred library of information - secrets known and used by the great prophets, psychics and spiritual teachers throughout history. YES, I want to see my future, better understand my past, decode my dreams and more. In Living Your Divine Contract, you'll find out how to access future events exactly the same way Morgan Robertson did when he wrote his prophetic novel - in vivid, specific detail, years before they are set to happen. But unlike Robertson, you'll be doing it with full awareness of the power you're accessing, and you will have the ability to alter the course of events in order to achieve a different set of outcomes. It is an extremely powerful exercise, one you can use time and again to gain specific insights into exactly where your life is headed at any given moment. Do you ever find yourself wondering why you are faced with certain challenges and problems? Why certain difficult people are a part of your life? Why you are stuck in a particular job, place, or relationship even though it doesn't make you happy? Why do certain things happen to you? In your quest to find the answers, you can spend a lot of time guessing and going down wrong roads and dead ends. Or you can simply open the Akashic Records and solicit exactly the information you're looking for. Your life as it stands today is the result of your past experiences and the determinant of your future experiences. Getting clear on your present circumstances and getting them ordered toward a happy and fulfilling future are two of the most important things you can do. The Akashic Records are the key to doing so with no mistakes or misinterpretations. The illness had appeared when she was two years old and had effectively stunted her growth and mental development from that day forward. Her doctors were baffled by the ineffectiveness of the treatments they had prescribed and had finally abandoned hope of her ever making a recovery. Her desperate parents had heard about Edgar Cayce's abilities and brought her to him in the hopes he could help where doctors had failed. The reading Edgar Cayce did revealed that just a few days before she became sick, the little girl had fallen out of a carriage and, unbeknownst to anyone, suffered an injury to her spine. Cayce zeroed in on that injury as the cause of all the maladies that followed. Her mother cast her memory back and, astonished, remembered that the girl had indeed taken a fall a few days before getting sick, just as Cayce described. Cayce recommended a specific treatment for the spinal injury, and once the doctors correctly applied it, the girl took an immediate turn for the better. She quickly rebounded and went on to live an absolutely normal, healthy life. Just as Aime's untended spinal injury kept her imprisoned in illness while baffled doctors looked on, unseen and forgotten-about "injuries" in your past may be imprisoning you in a life that is less happy, healthy, and fulfilling than it could be. Revisit your disremembered past experiences - even those that took place in previous lifetimes! Find out what your dreams really mean... and what they're trying to tell you! One of the most startling truths revealed by Edgar Cayce's life and work is the fact that nothing happens in our lives that isn't first foreshadowed in a dream. That assertion is so powerful it bears repeating: Nothing happens in your life that isn't first foreshadowed in a dream! The answers you're looking for, the information you need, clues about what's going to happen to you and when it's going to happen ... they're all there. The challenge is, they're often obscured, presented illogically or through symbols whose meanings don't immediately make sense to your logical, literal mind. Forget those "dream dictionaries" and any other ineffective tools you may have been given in the past. Dream interpretation doesn't work that way. But it does work! It is a skill that can be developed and perfected just like any other. Once you do, you will have the power to see events and their outcomes before they happen - and either anticipate them with joy, or change the present-day actions and attitudes that are leading you to undesirable ends, so that you can experience positive outcomes instead. When you have this knowledge, you can transform your destiny! The actions, experiences, and choices of your past are responsible for the life you are living right now. And today, at this very moment, you are thinking, feeling, and doing things that are determining the details of your future. That is why the paradox of the Akashic Records is possible: why your destiny is already written, yet at the same time is able to be shaped, molded, and even altered at any time by you. If you are interested in reading that endlessly fascinating story - finding out what shrouded, sometimes-glimpsed chain of events brought you to where you are today, and seeing the tomorrow you have already created for yourself (while you still have time to change it, if necessary) - then you must learn how to gain access to the storehouse of all that information and more: the Akashic Records. Please allow me to assist you in that discovery, by sending you Living Your Divine Contract: How to Study the Akashic Records and Discover Your Heart's Purpose. As you listen, you'll learn much more about this incredible storehouse of knowledge. And you'll discover the tools you need to establish that same life-changing connection with it. Keep Living Your Divine Contract only if you experience a true breakthrough such as the kind I've described above. You can return the program at any time and for any reason within 30 days for a full refund - no questions asked. The Akashic Records were the ultimate source of information for the most documented, accurate psychic ever known. What insights, visions, and unsuspected truths do they hold for YOU? Take this once-in-a-lifetime opportunity to find out, by ordering Living Your Divine Contract today. P.S. Edgar Cayce remains the most documented psychic who has ever lived. He was able to see events of the past, hidden truths of the present, and details of the coming future with uncanny, almost 100% accuracy, and he did it by tapping into the Akashic Records. You really can do the same thing! Order today - I can promise, you will be amazed by what you discover. I want to see my future, better understand my past, decode my dreams and more. I want an all-access pass to the amazing "Book of Life" so I can live the life I am truly meant to live! 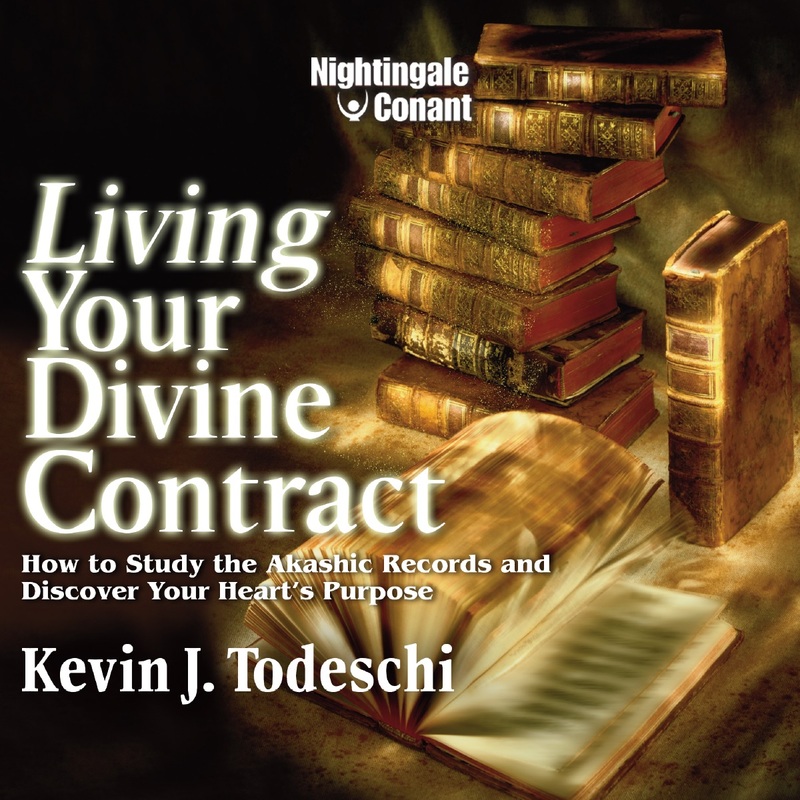 Please send me Kevin Todeschi's audio program Living Your Divine Contract, at the special price below. - I can select one of two ways of ordering.